Yes, that’s right! Straight lines are extremely important, and can be quite challenging to master, and I absolutely recommend spending some time on them. After you spend some time with this, it’s time to put it to use, don’t you think?!? 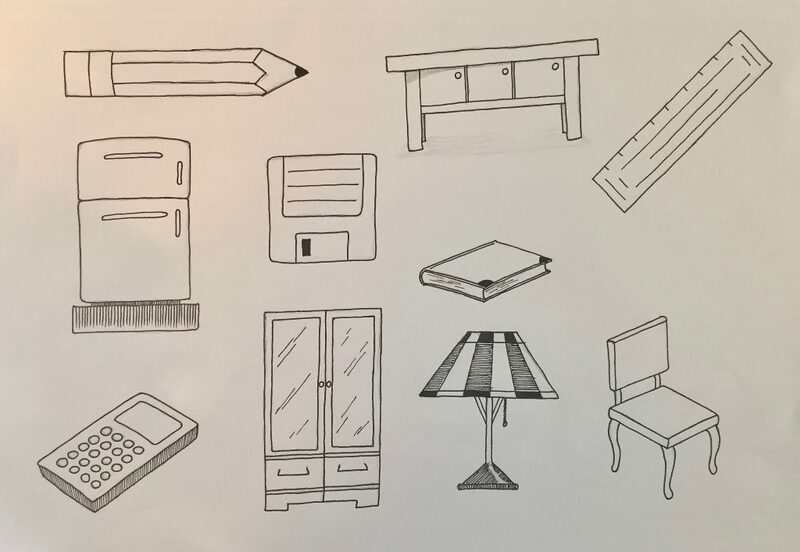 So here is a collection of some really simple drawings you can work on, consisting mainly of straight lines. This is a collection I came upon somewhere on the web, and I drew it as a practice of my own, and I absolutely recommend that you do the same thing. The easiest way is to sketch it out softly with a pencil first, and then thicken the lines afterwards, if you want to. I redrew everything in black ink in order to make it stand out better for this picture, but that is obviously not a necessity. As you can clearly see, I didn’t use a ruler for any of the straight lines in these drawings. You CAN use one if you like, but I would recommend that you don’t! First of, it’s good to practice straight lines in free hand, and second, rulers give a sort of “clinical look” to drawings. This is great if you are going for that “architectural feel”, but a lot of times the more organic line, that comes with the micro imperfections you automatically get when drawing by hand, is just more pleasing to the eye.